Israel refused to cooperate with the investigation and claimed that its own investigation “proved that the Israeli army acted in accordance to international principles, and did not violate the International Law”. Goldstone, a Jewish South African Judge, was appointed by the United Nations Human Rights Council to investigate Israel’s war on the Gaza Strip. Of 1,434 Palestinians killed in the Gaza invasion, 960 were civilians, including 121 women and 288 children, according to a United Nations special rapporteur, Richard Falk. Israeli military lawyers instructed army commanders that Palestinians who remained in a targeted building after having been warned to leave were “voluntary human shields,” and thus combatants. Israeli gunners “knocked on roofs” — that is, fired first at corners of buildings, before hitting more vulnerable points — to “warn” Palestinian residents to flee. With nearly all exits from the densely populated Gaza Strip blocked by Israel, and chaos reigning within it, this was a particularly cruel flaunting of international law. Willful killings of civilians that are not required by military necessity are grave breaches of the Geneva Conventions, and are considered war crimes under the Nuremberg principles. He is also on the board of governors at Hebrew University in Jerusalem. 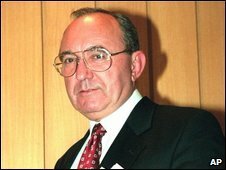 Mr Goldstone said he was “shocked, as a Jew”, to be invited to head the mission. “I’ve taken a deep interest in what happens in Israel. I’m associated with organisations that have worked in Israel.